Tour the home of the Boston Red Sox, including the press box, dugout, field, and more. Best for ages 4 and up. Tours leave from the Souvenir Store across Yawkey Way hourly seven days a week. Visit the park where the Babe pitched, The Kid hit, Yaz dazzled, and Nomar and Pedro still thrill young fans today. Soak up the rich history; hear the echoes of the past. Touch the Green Monster, imagine being one of the 'Knights of the Keyboard' as you see the view from the Press Box, visit the new Red Sox Hall of Fame presented by Volvo, and take a seat in the .406 Club before strolling around Fenway Park. The tour of Fenway provides fans with a behind-the-scenes look at America's most beloved ballpark. All areas are subject to availability. Tours of Fenway Park, the oldest ballpark in Major League Baseball, include the press box and broadcast booths; the new Red Sox Hall of Fame Club presented by Volvo; the .406 Club; the Dugout Seats; and Pesky's Pole. When the field is available, fans may also have the opportunity to walk along the warning track and come face-to-face with the fabled Green Monster. For more information and group reservations, call the Fenway Park Tours Hotline at 617-236-6666 or e-mail tours@redsox.com. What are the dimensions of Fenway Park? Fenway Park measures 310 feet (94.5 meters) down the left field line: 379 feet (115.5 meters) in left center field; 390 feet (118.9 meters) in center field; 420 feet (128 meters) in deep center field; 380 feet (115.8 meters) in deep right field; and 302 feet (92 meters) down the right field line. The left field wall -- also known as the Green Monster -- measures 37 feet (11.3 meters) high, with the screen above the wall extending 23 feet (7 meters). The center field wall is 17 feet (5.2 meters) high, the bullpen fences measure five feet (1.5 meters) and the right field fence is 3 to 5 feet (0.9 to 1.5 meters) high. When did Fenway Park open? Opening Day for Fenway Park was April 20, 1912. The Red Sox defeated the New York Highlanders (later named the Yankees) 7-6 in 11 innings before 27,000 fans. Tris Speaker drove in the winning run. Fenway Park was actually due to open two days earlier, on April 18; however, there were two postponements due to rain. Of course, the opening of Fenway Park was pushed off the front pages of Boston newspapers by news of the Titanic sinking. Navin Field (later known as Tiger Stadium) in Detroit opened the same day as Fenway Park. Where did the Red Sox play before Fenway Park? Prior to 1912, the Red Sox played their home games at the Huntington Avenue Grounds, now part of Northeastern University. The Huntington Avenue Baseball Grounds, an all-wooden structure, had a seating capacity of 9,000. The Boston gmes in the first World Series in 1903 were played there. The first game at the Huntington Grounds was played on May 8, 1901 in front of an overflow crowd of 11,500 fans as hurler Cy Young pitched the Boston team to a 12-4 win over the Philadelphia Athletics. What other teams have played in Fenway Park? Besides the Red Sox, several other teams have played in Fenway Park. In 1914, while Braves Field was under construction, the 'Miracle Boston Braves' played their World Series games in Fenway. The Braves swept the favored Philadelphia A's in four games. The Boston Patriots — now the New England Patriots — were fall occupants from 1963-68 before eventually ending up in Foxboro. The Patriots, however, were not the first pro football team in Fenway. The Boston Redskins played four years here before heading to Washington in 1937. The Boston Yanks played here from 1944-48 prior to traveling to New York, Dallas, Baltimore (where they became the Colts) and now Indianapolis. Collegiately, Boston College teams mostly of the Frank Leahy era, and Boston University with stellar quarterback Harry Agganis (later a promising Red Sox first baseman who died during the 1955 season) also played home games in Fenway Park. Taylor, by the way, was also the person who changed the club's name from the Pilgrims to the Red Sox in 1907. What's the largest crowd ever to attend a game in Fenway Park? The biggest baseball crowd at Fenway ever was 47,627 for a Yankees doubleheader on September 22, 1935. Those crowds will never be equaled under Fenway's current dimensions. After World War II, more stringent fire laws and league rules prohibited the overcrowding that was so common in the 1930s. The current capacity of Fenway Park is 33,871, lowest in the Major Leagues. From 1912 to 1933, there was a 10-foot-high mound that formed an incline in front of the left field wall at Fenway park, extending from the left-field foul pole to the centerfield flag pole. As a result of the mound, a left fielder in Fenway Park had to play the entire territory running uphill. Boston's first star left fielder, Duffy Lewis, mastered the skill so well that the area became known as Duffy's Cliff. In 1934, Red Sox owner Tom Yawkey arranged to flatten the ground in left field so that Duffy's Cliff no longer existed and became part of the lore of Fenway Park. Is the manual scoreboard still used? Absolutely! Fenway Park has one of the last hand-operated scoreboards in the Major Leagues in the left-field wall. Green and red lights are used to signal balls, strikes, and outs. Each scoreboard number used to indicate runs and hits measures 16 inches by 16 inches and weighs three pounds. The numbers used for errors, innings, and pitcher's numbers measure 12 inches by 16 inches, and weigh two pounds each. Whereas all other ballgame scores used to be displayed on the manual scoreboard, only scores from other American League games are posted there now during Red Sox games. That change to the scoreboard occurred in 1975, when the wall was remodeled and when Fenway Park's first electronic scoreboard was installed. Scores from ongoing National League games are now displayed on the electronic scoreboards around Fenway Park. Behind the manual scoreboard is a room where the walls are covered with signatures of players who have played at Fenway Park over the years. Also, the initials TAY and JRY — for Tom Yawkey and Jean Yawkey — appear in Morse code in two vertical stripes on the scoreboard. What is the meaning of that seat painted red in the bleachers? 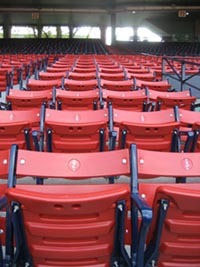 The seat in the right field bleachers is painted red to mark the spot where the longest measurable home run ever hit inside Fenway Park landed. Ted Williams hit the home run on June 9, 1946 off Fred Hutchinson of the Detroit Tigers. The blast was measured at 502 feet. Legend says that the ball crashed through the straw hat of the man sitting in the seat — Section 42, Row 37, Seat 21. Even though Pesky's Pole was dubbed that in the 1950s, the phrase really didn't become popular until the late 1980s or early 1990s. According to former Red Sox star Johnny Pesky, it was Sox pitcher Mel Parnell who coined the term, after Pesky hit a home run just beyond Fenway Park's right-field foul pole. That home run — one of only six homers Pesky ever hit at Fenway Park — won the game for Parnell. No player has ever hit a home run over the right-field roof at Fenway Park. The screen behind Fenway's home plate that protects fans and allows foul balls to roll back down onto the field was the first of its kind in the Major Leagues. The padding at the bottom of both left- and center-field walls at Fenway Park was installed after the 1975 World Series. In Game 6, Sox outfielder Fred Lynn crashed into the then-concrete wall in center trying to make a catch, and then lay on the field for several minutes. In 1945, a throw by Athletics outfielder Hal Peck hit a pigeon flying over Fenway Park. The ball then deflected to the A's second baseman, who tagged out Boston's Skeeter Newsome trying to stretch his hit into a double. The pigeon flew away, minus a few feathers but otherwise unharmed. Another pigeon was not so lucky in 1974. Willie Horton hit a foul ball into the air at Fenway Park, hitting a low-flying pigeon. The pigeon fell from the sky — dead — and landed in front of home plate. Other attraction that are between 7-15 minutes away include The Boston State House, The Museum of Fine Arts, Boston Public Garden, Old North Church, The New England Aquarium, Boston Children's Museum, Boston Tea Party Ship & Museum, andThe USS Constitution. Find lots more ideas on fun things to do in Boston. 9 a.m. to 4 p.m. or until three hours before game time, whichever is earlier. No Tours on Columbus Day, Thanksgiving Day, Christmas Day and New Year's Day. Always advisable to call ahead and check with for exceptions (i.e. on weekdays with day games or Sat/Sun when games are played at Fenway). If you are looking for a true tour do not take the last one before a game. The cost is more and it is nothing but a cattle drive. They over book, march you in and take your picture so they can charge you more money but at least they sit you up in the monster seats for 20 minutes of batting practice. They did not offer any information but did answer questions when asked.